Alte Nationalgalerie, Berlin. As seen in Google's Art Project. Screen shot: Kevin Buist. Yesterday, Google launched Art Project. 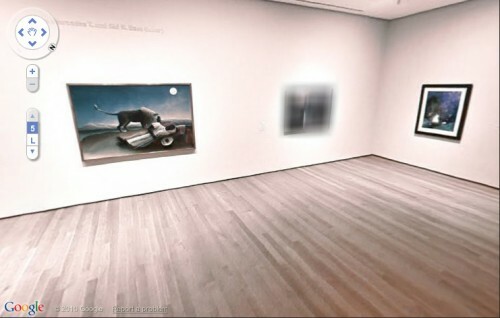 Art Project brings the technology of Google Maps Street View into a handful of the world’s best art museums. Users can virtually wander through various galleries and click and drag to explore full panoramic views. The experience moves beyond the street version, however, in that it lets you click to see hi-res details of selected works and allows users to save and share collections of the their favorite finds. Most art and technology news outlets heralded Art Project as a great step forward in bringing museums and technology together, and it is. But as I started clicking around various virtual museums I found myself dwelling on the limits of the experience, despite the fact that it does so much to expand access to these museums. Running up against virtual barriers eventually became more intriguing than the art itself. I started my journey in the Art and the Sublime gallery in Tate Britain. I’ve never been to the real Tate Britain, and I was pleased to find a truly fantastic collection of paintings there. As I meandered from piece to piece, I came to a doorway through which I could see another gallery containing paintings too distant to make out. I clicked to move through the doorway and I was awkwardly shunted to the side. Trying again, I was shifted to the other side of doorway, still unable to pass through. Checking the floor plan in a window to the right, I realized that only a limited number of galleries in the Tate were photographed for the project. As much as I loved the Sublime gallery, I found myself instead transfixed by the doorway through which I could look but not pass. The Tate's impassable doorway. Screen shot: Kevin Buist. Technology often creates this effect. The closer a virtual experience gets to a genuine experience, its deficiencies become more apparent, not less. The field of robotics has encountered a similar phenomenon, dubbed the uncanny valley. The theory states that when robots and other human facsimiles look almost human, they are considerably more revolting than robots that don’t try to look human. For example, compare R2-D2 from Star Wars with any number of recent life-like androids produced in Japan. The former is endearing, while the latter is just creepy. A chart showing the uncanny valley, from Wikipedia. Later, while exploring MoMA, I found myself ignoring Rousseau’s The Sleeping Gypsy and instead pondering a painting next to it that had been blurred out. For some reason, I would guess copyright, a number of works are digitally blurred in the same way faces and license plates are blurred on Google Street View. This is disrupting to say the least. Imagine yourself standing in front of The Sleeping Gypsy in real life, and noticing that the painting next to it was covered by a shroud. Wouldn’t you want to peek? A redacted painting in MoMA. Screen shot: Kevin Buist. Google’s corporate mission is as simple as it is vast: “Organize the world‘s information and make it universally accessible and useful.” The impassable doorways and blurred paintings of Art Project are significant because they represent the failure of this mission. Or at least its current limit. Even Google–a corporation whose reputation for providing access to information is so ubiquitous that its name has become a verb meaning to access information–has limits. To be clear, I do not think the limitations of Art Project make it a failure. It’s a wonderful service. But it would be naive to think that Art Project is simply a tool that provides access to art. Google, along with every other website, is not a neutral entity. It has a purpose and it succeeds and fails in various ways. The Internet is like an artwork in that it’s much more than a simple information delivery system. The same way that Rousseau was doing much more that just showing you a gypsy sleeping by a lion, Google’s Art Project is a collection of decisions based on a particular set of assumptions, produced in a particular cultural context. When you use the Internet to give people greater access to images of paintings, it ends up being about a lot more than just painting. The delivery system is just as loaded with meaning as the content. I was actually a bit surprised by the conclusion on this article regarding assumptions and cultural contexts. Isn’t this something we already generally accept as a risk of pretty much any presentation via any medium, even possibly when standing right in front of the thing non-virtually? I think it was called Postmodernism, wasn’t it? Now just think about all those presentations we take for granted in our daily life in which the blurred parts and blocked doors are not quite so obvious. Also, I’m not sure the use of the concept of the uncanny valley works here. It seems a bit of a stretch to even bring it up. Don’t confuse frustration with revulsion. Kevin: two quick (and quite big) questions. (1) Like Calhoun, I’m not sure about the reference to the uncanny valley – can you explain what you mean? (2) What exactly are (do you think) the ‘sets of assumptions’ created here? I’m sure there’s a lot to be said, and I’d love to hear what you think. Good question, I’ll break this into two comments. While the deficiency of one is frustrating and the other is revolting, my point is that they both capture your attention more than it seems like they should. The uncanny valley graph is useful because it shows that what “should” be a linear progression is not. And both leave an open question, why does this happen? I don’t know the answer, but I’m fascinated by the question. For example, if I were browsing MoMA’s collection on their website, I would probably never notice that a number of works were not digitized for copyright reasons. It’s only when the experience becomes more lifelike that the deficiencies become apparent. Robots work the same way, we realize how unreal they are when they’re almost real. Another way to put it would be that virtual people and virtual experiences both share a strange quality in that they move in two directions with a single motion. They’re progressing toward more lifelike experiences while simultaneously moving away from them. And this duality happens with a single advance, which is really weird. I know that referencing something from robotics is a bit of a stretch, but it’s a very intentional one. I easily could have called it postmodern, or called it an example of the simulacra, but I did not want to do that. I think that using those terms can often take a discussion down a rabbit hole where a lot of readers won’t follow. It’s not that those terms are wrong, if fact they’re probably *more* accurate, but I’d rather make a horizontal move than go deeper into artspeak where less readers will follow. The set of assumptions inherent in something like Art Project is incredibly vast. I could only begin to scratch the surface. More than anything it’s an open question that I think is worth investigating. I brought it up for two reasons. One, (and this is a huge generalization) I get the feeling that a lot of artists and a lot of people thinking about art aren’t thinking very seriously about the implications of the Internet. I think that all people, not just art people, tend to choose how seriously to take something based on whether or not it fits a certain set of prerequisites. In art this most often takes the form of only addressing something deemed to be produced by an Artist, or that is clearly a part of the narrative of art history. This is really limiting, and I think if we stick to that we’ll end up missing some of the most interesting things related to images and meaning happening in our time. In a hundred years I think people will definitely ask “What was Google? What did it want? What values guided its decisions?” In that sense Google is an author, and I think we should start asking those questions now. Two, the tendency to take a myopic view and miss things right in front of you goes both ways. Google is doing this, too (or at least I think they are). They operate on the idea that people want to more easily see things that that are usually difficult see. So they want to show you what your hotel in London looks like before you go there, and they want to show you the inside of the Tate. But when it comes to art, the very act of looking is so incredibly loaded. Creating a new way of looking, given all the ways artists and theorists have explored this idea, is full of all sorts of interesting implications. I’m not faulting Google for not considering all this. In fact I think it’s really great that they’re doing things like this that generate questions. I did have another experience that starts to get into this territory that I didn’t write about. When exploring Versailles I came across a trompe l’oeil painting depicting a plaza receding into space, rendered using perfect perspective. If I adjusted my position in the room just so, the perspective in the painting became indistinguishable from the perspective in the panoramic photo of the room of Versailles I was looking at on my computer screen. Where does that lead? I’m not sure, but it certainly adds a layer to the thinking about looking that has always been a part of the dialog around painting. Doesn’t the ‘uncanny valley’ only exist because of the wrong assumption that a life like robot will actually be life like and that Google Art can give you the same experience as actually going to the museum. I don’t think even Google thought they were able to give you that. I’d also be interested to know what are the “most interesting things related to images and meaning happening in our time” that you suggest are not made by artists? Thanks for your reply Kevin. This is a fascinating area, obviously, and I’m interesting in hearing more about what you think. What do you think ARE the implications of Google’s ‘new way of looking’? What DOES that (amazing sounding) Versailles image lead to, do you think? I realise that this is “raising questions”, but what are the questions? And what are the answers? Most people (I refer to students I’ve spoken to about this) don’t see Google Art Proj (and by extension, the internet as a whole) as having much of an agenda beyond the obvious commercial one. First of all I’ll say that I find the unknowns of Google’s new way of looking fascinating as unknowns. I think they’re valuable to ponder as unanswered questions, and doing so is necessary even before we’re able to answer them. Of course that doesn’t mean we shouldn’t try to answer them anyway. I don’t think I’m able to yet to a satisfactory job, but I’ll take a stab at a few things. The Versailles example is a new iteration of an idea that’s not so new, the idea of exploring the tension between the picture plane as a window and the image it purports to show us. When paintings like that were made it was the pinnacle of the idea that the picture plane is a window into another world. Painting has since retreated from that notion, instead embracing the fact that the picture plane is a surface covered in paint first and foremost (and then a bunch of stuff happened after that, but that’s beside the point). If we draw a parallel from painting to how virtual environments are rendered on computer screens, it seems that approaching the picture plane as a surface (both physically and theoretically) is usually unquestioned. Another thing. I can’t remember where I read this, but someone was talking about how the internet is this really odd cultural hybrid because of the strange nature of its origin. On the one hand, it’s the product of Cold War US defense spending, it is quite literally a by-product of nuclear paranoia. On the other hand, so much of what it has become was forged by a small group of ex-hippies living near San Francisco, the very people opposing the excessive madness of nuclear paranoia. As a cultural force, the Internet is very young, and I think those influences are still very much present. So how does that play into Art Project? Art Project is an extension of Google Maps. Google Maps is part of Google’s dreamy, utopian ambition to catalogue the world’s knowledge, but it’s also a creepy, almost Orwellian surveillance tool. Have you ever found your own house? It’s there. And anyone else can find it too, if they know where to look, and there’s a good chance that a simple Google search will tell them where to start.